Tonight, forty Flin Flon residents were gathered in a cozy family room, wine glasses and cheese-and crackers in hand. But this was no committee meeting or book club: this was a professional concert, a performance by two musicians, Kyle Carey and Craig Werth, who had driven together from New Hampshire to perform for this appreciative crowd. 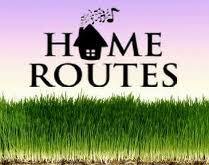 Tonight’s event was part of an initiative called Home Routes, whose mandate is to “expand the performance infrastructure for folk music”, by focusing on what they call house concert circuits (read more about Home Routes here). Alone and together, Carey and Werth were compelling performers, and the concert was a truly unique experience for me. There is something about a small venue that makes music so much more powerful and so much more personal–and performing to a forty-person crowd in a family room is about as personal as you can get. Craig Werth is a skilled song-writer, singer and guitarist, and he set the tone for the evening with his modest charm. His songs varied from an ode to the zucchini to a tear-jerking lament for “Christmas in St. John’s,” and yet Werth had the emotions of the crowd in the palm of his hand through the whole performance. When Kyle Carey took the stage, her voice almost made me gasp, it had such a hauntingly beautiful, other-worldly quality (you can hear it for yourself here) When she sang in Gaelic, Carey almost seemed to enter a trance, bringing the audience right along with her. These two singers accompanied each other wonderfully, and in such an intimate venue, you could actually observe how each song subtly altered the tone in the room and affected the mood of the audience. Truly a testament to the power of music. I can’t believe my good fortune in getting to be one of the few attendees at this very special concert, and I’m looking forward to many more. « Life Lessons: What do you wish you knew 5/10/15 years ago?